First things first, I must apologize for the delay in this second installment of Bite-Size “Hannibal” (covering episodes 3 and 4 of the third season). Ironically enough I was on vacation at the happiest place on Earth (Disneyland), yet I had this insatiable craving to watch my favorite cannibal TV series when I returned home. One major (sad) development has taken place in my absence and that’s the cancellation of “Hannibal” on NBC. Sadly, due to character copyright disputes (over Clarice Starling) it would appear that the show’s third season will likely be its last. However, this gives me some hope that there will at least be closure to Will’s story line this season and if anyone wants the conclusion to “Hannibal” the TV series, they can just watch “Silence of the Lambs” and “Hannibal” (the 2001 Ridley Scott film) for those plot developments. Without further ado, let me get into the tasty tidbits that are appetizers for Episodes 3 and 4. Looking pretty good for a guy who took a bullet to the face, don’t you think? 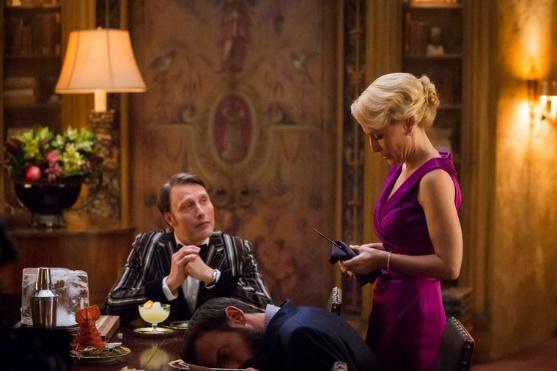 Appetizers: Hannibal’s second season contained a whole lot of characters seemingly biting it in horrible ways. It all made for a daring show that went into seriously dark territory, but fans have speculated that certain characters actually survived their deaths; which ranged from being pushed out of a second story window to being shot in the face. Apparently, they weren’t wrong in those far-fetched assumptions, because a lot of folks thought deceased have actually popped back up. Being shot in the face or slashed open can’t keep good characters down. 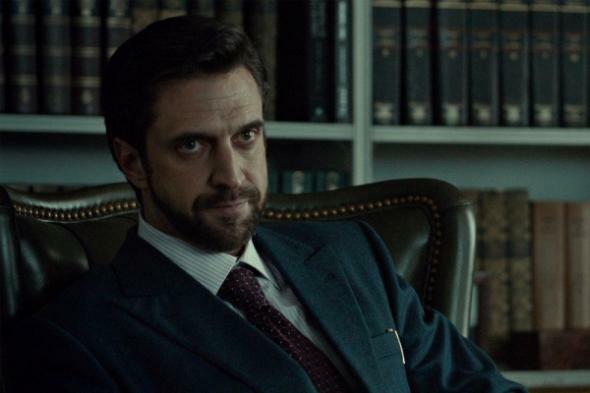 Chilton (a corrupt doctor desperate to get Hannibal into his asylum) apparently only has a slight scar, a dead eye and some dentures as a result. Conveniently all three of these disfigurements can be covered up with make-up. Which means that he mainly looks like the actor playing him as opposed to a survivor who took a bullet through the cheek. He wasn’t the only surprising face to see come back, because Alanna Bloom (Will’s former love interest and Hannibal’s former love interest) was merely crippled from her fall out of a two-story window as opposed to actually killed, like everyone assumed she was. Normally, I would be pissed off about so many deceased characters turning out to be alive (albeit scarred and disfigured), but I love these characters so much that my giddy fanboyism is preventing from getting angry about it. 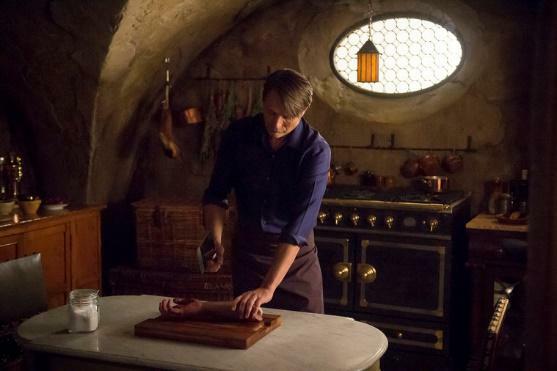 What a typical after dinner clean-up looks like at Hannibal’s house. Main Course: “Secondo” (the third episode) makes a significant improvement over the last two episodes. The non-linear structure continues as we jump back and forth to the present happenings, the aftermath of Season 2’s violent climax and some events that occurred before that. However, this third episode seemingly does the impossible. It makes “Hannibal Rising” (which was written and filmed as a cheap cash-in on the well-known series) enjoyable. That’s right, the cheesy over-the-top, ridiculously samurai-centered origin story for one of cinema’s greatest psychopaths has actually been transformed into something feasible. That means we get a crazy Asian woman connected to Hannibal’s dark past and a couple of grisly revelations, such as Hannibal’s sister was eaten during WWII and that contributed to his unique palette for human flesh. Other than that, we see Jack Crawford (Lawrence Fishburne) chatting briefly with Pazzi (who has yet to meet in inevitable gory fate). Hannibal and his psychiatrist/lover encounter some relationship problems, blah, blah, blah, and then Hannibal delivers one of the grisliest moments in the show’s history. To be specific a knife is sticking out of a man’s head and he’s twitching, blinking, laughing, and speaking gibberish for a few minutes. While episode three was a definite improvement over the lackluster opening two from this season, “Aperitivo” marks a return to the series that I know and love. It’s not a perfect episode, mainly thanks to some unneeded drama about Jack Crawford’s deceased wife, but it brings back one of the most interesting characters of the whole franchise: Mason Verger! (Yaaaaaaay, have a chocolate!). Verger is so twisted and despicable as a villain that you just can’t help but love to hate him. With Michael Pitt stepping out of the role (he played it perfectly in season two), I can say that Joe Anderson was a wonderful replacement as the demented psychopath. I honestly couldn’t really tell that it was a different actor, but that could also be attributed to Verger missing half of his friggin’ face, which we see in a stomach-churning surgery scene. We also get introduced to Cordell (who also appears in the 2001 Ridley Scott film). Cordell is Mason’s nurse and winds up being just as depraved as his master. He’d do anything for Mason, which leads to some nastiness down the road. Ironically enough, this fourth episode features little to no actual Hannibal on-screen and winds up being the best episode of this season thus far! Dessert: Since Hannibal’s cancellation has been announced, it’s really putting in perspective how this season might serve as closure for the series. I might become overly critical of every plot detail, but I still love the show for all its minor problems. Hannibal’s still eating people. Will is still finding himself after his sanity shattered. Jack might wind up hunting Hannibal one last time. Meanwhile, Verger, Chilton and Bloom have formed a sort of unholy alliance together that may play out the story arc seen in 2001’s “Hannibal” (Cordell, pigs and all). This might serve as a satisfying final season to the series and even if it doesn’t, we’ll still have the episodes that hold up on their own merits. I’m so very happy to say that “Hannibal” has returned back to its delectable, disturbing form and I can’t wait to dig into more! See you very soon for my thoughts on Episode 5! Tagged Alanna Bloom, cannibals, Chilton, Clarice Starling, Cordell, disturbing, Hannibal, Hannibal Lector, Jack Crawford, Joe Anderson, Mason Verger, Pazzi, psychiatrist, serial killers, Silence of the Lambs. « House Shopping is Hell!